It’s difficult to know where to start on a review of Ghalib Islam’s Fire in the Unnameable Country. The book is a thing apart. It’s a unique entity without direct comparison, although maybe a collaboration between Jose Saramago, Haruki Murakami and Franz Kafka would come close. Islam’s tale breaks every rule you can think of, in terms of grammar, syntax and storytelling structure — not to mention the bounds of reality — and produces something that can draw gasps from a reader. It is, in short, a wholly remarkable and beautiful book. The story is set in a fictional land marked by intrigue and revolution and dictatorships and war. It starts in the past, when spider silk fields covered the land and there was relative peace. In time, surveillance descended onto every corner of the country and there were no more secrets. Something called the The Mirror, a sort of Hollywood surveillance/reality television system, fights with the state for snooping dominance in a world devoid of privacy. In this land we follow Hedayat, the central character, as he navigates the hidden corridors of the country — working as a smuggler and a caretaker of ghosts — falling in love and recounting his family’s history. It’s a sometimes confusing timeline, going back to the founding of the unnameable country, and made even more so by the surreal happenings within this surreal land. It’s a land where Hedayat’s father worked in the bowels of the bureaucracy, dealing with thoughtreels, which contain the minds of the country’s inhabitants. A land where Americans invade to destroy the spider silk fields which can weave armour. Where Hedayat, and his father before him, use glossolalia as a weapon and a means of influence. Both the story and the writing are challenging, and the initial pages pass slowly as your mind adjusts to Islam’s structure and cadence. Once fully immersed in the tale, however, this is a captivating read. Belief is suspeneded as you’re taken on a fantastic ride of flying carpets and rebels and giants and underground caverns and neverending bureaucracy. Islam’s writing is so incredible you will occassionally find yourself breathless. It’s all made even more remarkable by the fact that this is Islam’s first published novel. First-time novelists are not supposed to come out of the gate with such a forceful challenge to the status quo. This isn’t simply a new kind of story, but a new kind of storytelling that would be almost impossible to duplicate. It layers metaphor upon metaphor and ideally should be revisited more than once to catch all the nuance. It’s the kind of book that leaves you wondering just how much of it you missed at the end, or whether the author was simply messing with you for half of it. Your own theories on certain aspects of the book would likely fill pages. Hidden amongst the magic and the scattered words and phrases, however, are real world messages about torture, abuse, dictatorship, colonialism and war. This is a magic land beset by the horrors of the contemporary world and Islam doesn’t hold back, letting his poetic writing batter the inequities. This is a staggering work by a writer that it sure to one day loom large in our consciousness. If you’re up for a challenge, this is a must-read. 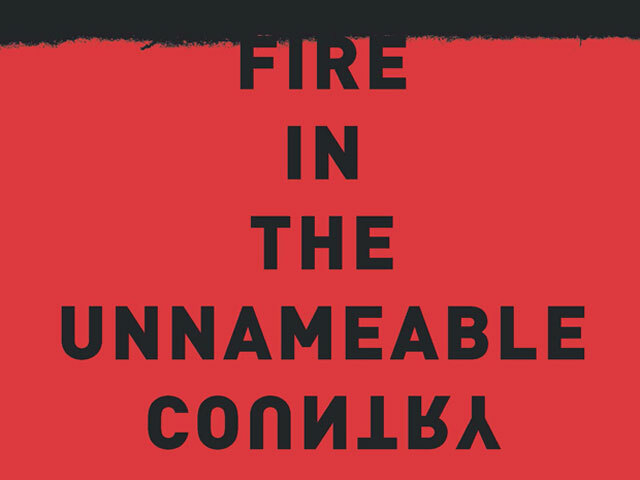 Fire in the Unnameable Country, by Ghalib Islam, Hamish Hamilton, 448 pp.